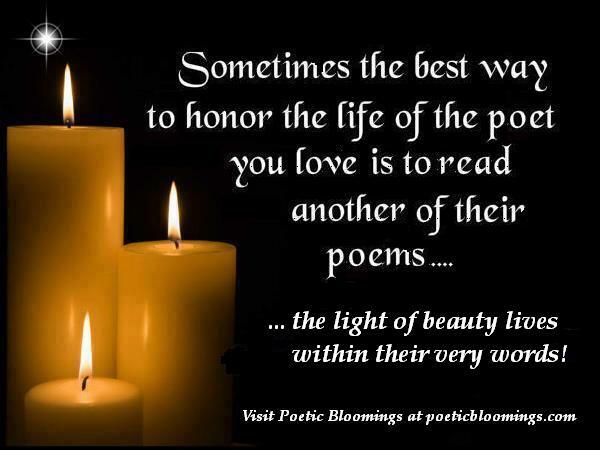 I am so excited to be here at Poetic Bloomings with so many talented and lovely people. I hope you’ll visit my blog sometime, and please, don’t be afraid to offer constructive criticism. I really want to learn and hone whatever skills and talent God has given me. I have written poetry on and off for years but just in the past couple of years gotten really serious about it. I found out that my local library has a group called “Appalachian Pen Works Writers” that meet once a month. It was there under the tutelage of Salvatore Buttaci that I began to learn about poetry forms and terms. I have long rued the fact that I didn’t go to college, and maybe one day that will be an option, until then, I am reading more poetry and taking a class once a week from Sal. A little about myself: I am 61 years old, have three beautiful children, Angel, her husband Patrick and two boys live in Richland WA., Tommy and his wife, Ashley live in Dothan, Al., and Erin and her husband Josh and four boys live in Washington Court House, OH. My husband, Kyle and I will have been married for 36 years this August. © All postings and intellectual materials on this page are property of Debi Swim. glimmers of white and blue. moving only from the waist. filling the night with expectation. this lovely world seemed sweet and green. My thoughts were filled with only you. Love seemed so simple then and true. like powdered, choking dust it flew. I’ve lived to see what love can mean. but, thou, Lord has delivered my soul from death. No, Thou art the light, life everlasting you gave. In a twinkling I’ll put on immortality. day. Discerning there are just so many and no more. A measured number known to God, meted one by one. of gold with no fear or thought of running out. in foolish youth. Time laughed at my poor innocence. I celebrate each day, by God’s good grace, a gift. a spindly stem of clover. as triad at nature’s core. though here green beer holds sway. Nod to skies of blue. With chow chow on top. not sneaky, sly but could look you in the eye. fun-loving, silly but with an easy charm. All the worse in others in him was no trace. Just knowing this lad enriched the human race. around which bouncy curls framed a cunning grace. in silence at an outcome they could but guess. that rivals any famous sultry shore. this undoubtedly your finest hour. Sometimes, I have a hanker keen. Oh, to be thirteen and vibrating with life’s craved mysteries fair. Orange cat, crouching on the post.